A few months ago I through that Android and iOS would drive the mobile world in the next years. However 2013 is bringing fresh air in the field. New alternatives, specially those based on Linux are trying to find their place in this, still, emerging market. First of all, let’s see the status of the mobile world. According to a recent study from Ericsson, (PDF) the global mobile penetration reached 89% in Q4 2012 and mobile subscriptions now total around 6.3 billion. However, the actual number of subscribers is around 4.4 billion, since many people have several subscriptions. The Africa mobile penetration rate (# of subscriptions divided by population size) stands at 67%, which is still the lowest of all global regions (as defined in the report). Ericsson does note the differences between subscription and subscriber, since subscriptions are often shared in developing regions. 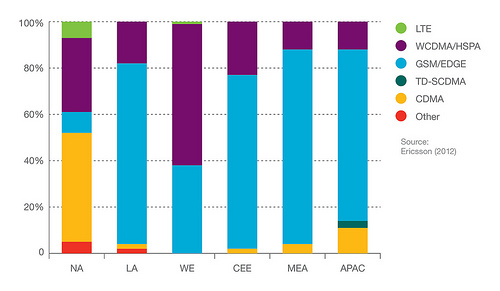 – China alone accounted for ~22 percent of net additions, adding around 30 million subscriptions. – India (+11 million), Bangladesh (+9 million), Indonesia (+8 million), and Nigeria (+5 million) follow in terms of net additions. – Mobile subscriptions have grown around nine percent year-on-year and two percent quarter-on-quarter. – In Q4, mobile broadband subscriptions1 grew ~125 million to 1.5 billion, reflecting a 50 percent year-on-year increase. mobile phone subscriptions uses smartphones, which means that there is considerable room for further uptake. net additions. LTE subscriptions grew from 14 million to 57 million. If we talk about smartphones, according to IDC, a research firm, more than 90% of the 228m smartphones shipped in the last quarter of 2012 belonged to both Android or Apple. Android is the bigger beast. Its share has grown as the smartphone market has boomed, to about 70%. The new candidates threaten the status-quo are: firstly the Linux-based OS, Samsung with Tizen, Mozilla Foundation with Firefox OS and Canonical with Ubuntu and on the other hand we have Windows Phone 8 and Blackberry. Apple and iPhone. Created under the Keep things simple style of Apple. The iPhone was the first actual smartphone. Furthermore, Apple created the first successful marketplace for apps which was the real revolution in the mobile world. It’s a closed ecosystem: robust technology based on a centralized release of hardware and software. Most of the apps available in the market are asked to accomplish a good quality standard. Apple presents an integrated view of iOS 6, iCould, and MacOS working together to create value for users. Apple tries to deliver exhaustive tested hardware and software and there are only a few examples of big failures, the iPhone 4 problems with the antenna and the recent more serious strategic error with the new maps. Android. Apparently it follows the opposite approach of iOS releasing the OS as open source software. Nevertheless, Google has a huge control over the ecosystem. It sets up the development schedule and the OS releases. It owns the Android trademarks and logo. Likely this is one of the main reasons that is pushing other stakeholders to work in new alternatives. Also, there are pararel projects based on the Android code, the most well-known is CyanogenMod. CyanogenMod is an open source replacement firmware for smart phones and tablet computers based on the Android mobile operating system. It offers features and options not found in the official firmware distributed by vendors of these devices. Anyway, Android is doing a great job. The last version of Android, the Ice Cream Sandwich version, offers a great user experience and the Google Play has reached the 700,000 apps recently. Nevertheless, Android is still facing two major issues. The first one is that Google does not present the user with a unified view of the value offered by its mobile devices and cloud services (the “Android ecosystem”). Each product seems to be fighting its own war. The other one is the fragmentation both in terms of devices and in the current versions supported. From my point of view. Windows Phone 8 is good product with the advantage of familiarity. Microsoft hopes that Windows’ dominance of personal computers can be transferred to mobiles. With that in mind, all new Windows devices, on desks, on laps or in hands, have the same look, with “tiles” for touching, not clicking. Blackberry. They are losing the battle of the general public but it is still very appreciated within the companies’ information-technology departments. Blackberry is trusted specially because of the security issues. 80m people use BlackBerrys. Tizen. Tizen is an open source effort led by Samsung and Intel, hosted by the Linux Foundation, that will support multiple device categories: smartphones, tablets, smart TVs, netbooks, and in-vehicle infotainment devices. It will be based on HTML5 and other upcoming web standards, which is one of the main reasons why MeeGo had to be replaced. Apparently they are targeting cheaper smartphones for Tizen in order to deal with this emerging market. Ubuntu. Canonical announced some days ago the new Ubuntu mobile. The most interesting features of Ubuntu is the seamless integration of the different environments: desktop, tablet and mobile. One reason for the challengers’ optimism is that a lot of ground is unoccupied. Mary Meeker of Kleiner Perkins Caufield & Byers, a venture-capital firm in Silicon Valley, estimates that late last year smartphones accounted for only 17% of the world’s mobile subscriptions. 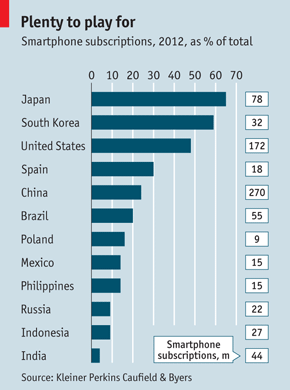 In big emerging economies such as India, Indonesia and Russia the share is less than 10%. Even rich countries are not saturated (see chart). Brazil, Mexico, Poland and Spain are among the early targets for Mozilla and its partners. There’s a huge market in developing countries for cheaper smart phones. And also a huge market in the developed countries for new smartphones.